type with nine fingers instead of ten. Not by choice! Holding the rogue finger above the keys, I make mistakes, correct them, and start again. Soon my hand cramps; then my novel goes mute. The cause? On July 23, 2017, it is red, swollen, and throbbing with pain that I’ve put up with for four months now. The doctor lances it due to a fungal infection. Now two days later on July 25th, she unwraps the wound on my left middle finger. Stunned, we both gasp at the blackened fingertip. She calls it necrotic. I’ve seen frostbitten hands on TV look like this before. She calls another doc to examine the finger. His concern is obvious. They determine I need to see an orthopedic hand surgeon today—this cannot wait. The closest one is located in San Antonio, sixty miles from where I live. I get an appointment for the following day, Friday. My physician says, “I won’t bandage it. I want air to get to it. For now, it is dry gangrene, which is good, because wet gangrene leads to amputation. Yes, you can take a bath, but don’t let it soak. Dry off quickly. We don’t want you losing that finger.” No joke! Later, I explain to my husband Lynn I might lose the finger. We stare in disbelief—it’s not just a wound, but useless tissue. Though not one to think the worst, I’m distracted by worry. I anxiously drive alone to find the doctor’s office in San Antonio the following day, fighting traffic in the fifth largest city in the nation. I want to scream, “That’s all?” I carry the finger attached to the hand out the door to drive home with nine fingers on the wheel, wondering what is going to happen. When I arrive home after 5:00 on this Friday afternoon, I have an email from a friend from my Quaker Meeting. I wait, however, until Monday morning to reluctantly call the orthopedic surgeon and explain to his nurse that my friend highly recommends I receive hyperbaric treatment. I wait for a return call, which comes in forty minutes with an appointment at another clinic the following day for an evaluation—again in San Antonio. My husband is unavailable, so I am off to the city alone. HBOT, short for hyperbaric oxygen treatment, is used for divers who get the bends. 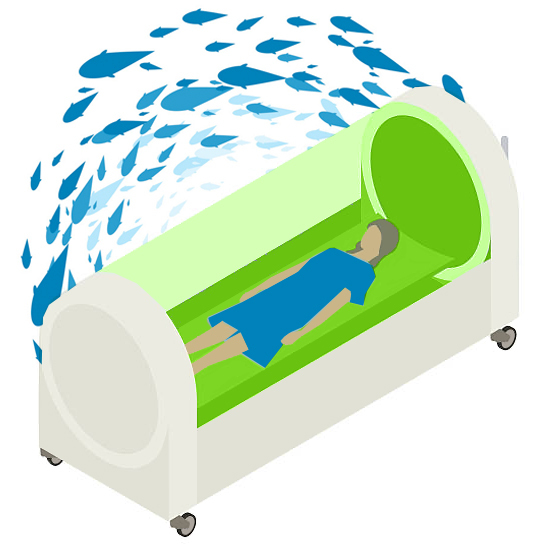 During HBOT treatments, patients breathe 100% oxygen for about two hours. In my case and for many with wounds that do not heal easily, like diabetic patients, HBOT gives the body a healing chance with multiple treatments over time. The PA explains the risks of pressurization: I can burst an eardrum or have permanent loss of hearing, sinus problems, and/or change in eyesight, which will return to normal over time. Then he tells me that I need to come in daily, Monday through Friday, for the two-hour treatment. I can read (but only new books, because old books with oily handprints can ignite in the chamber) or watch TV that they offer. Finally, I must wear a surgical gown or my own clean, all-cotton clothing in the chamber—again fear of igniting. They assure me they minimize those risks. My first time in the tube, as I call it, they wheel me into the clear glass chamber with two blankets to keep me warm. They seal the door behind me, ask if I’m okay, and tell me they will start pressurization. They slowly lower the pressure over six minutes to the same depth as if I were 30 feet below water. They have a phone they pick up to speak to me. I simply have to talk for them to hear me. I breathe pure oxygen for ninety minutes until they depressurize the chamber—another six minutes coming up. Day one and I’m done. I have nineteen more to go—a month of treatments. This is a major interruption in my daily schedule of writing; but I cannot write anyway, so why am I whining? The next day, I am up early to walk the dog, get ready, make and meet appointments, get errands run, then I hightail it to San Antonio. I return home for a nap each afternoon. At night with Lynn, I distractedly watch TV and massage my finger and hand. It itches; I suspect nature’s way to stimulate the blood flow. I cannot scratch it, or I irritate it, so gently rubbing is the answer. All the while, my characters rendezvous in my head. The fingertip is black, but below the skin down to the second joint has turned hard, like a plastic coating and is the color of dried blood. It no longer feels like skin or gives like flesh. I wonder if they mean part of or the entire finger; nevertheless, I am not going to ask. After my month-long stint in HBOT, the finger is no better, no worse. The fingertip is dead and therefore numb. 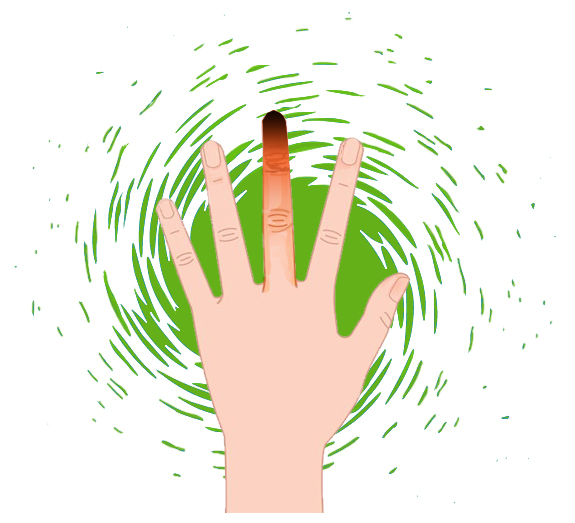 But the rest of the finger is hypersensitive even to the touch of a bedsheet or a tissue, whereas a towel is unnerving. I’m surprised to discover the adjacent fingers take on sympathy pains. The nerve in my palm that connects and coordinates the fingers is firing. My hand and first three fingers ache, burn, itch, tingle, and even tickle sometimes. It is no laughing matter. I decide to write about this injury—it deserves its own story. I will start tomorrow. But tomorrow runs into weeks. The PA tells me I could use another round of twenty treatments. Insurance will pay, but it means that I must put my life on hold for another month—as well as my novel. With Lynn’s encouragement and reassurance, I decide to stay week-five in a hotel near the treatment center—to reduce stress and encourage healing. I try to work on the novel, but my hand cramps too much to work steadily. Week number six, I stay with friends from church who live close to the clinic. I am as committed to healing my rogue finger as I am to my novel. Nevertheless, one must come before the other right now, so the novel remains mute. The toll of healing a digit has taken up more time and psychic energy than I could have imagined. Distracted and unfocused, I open the freezer to look for fresh bread. I search for ice cream in the laundry room. I forget to buy items on the grocery list that I have with me in my hand. I watch dust-bunnies grow, too tired and too stressed to vacuum or dust. I fail to write down writer-group meeting dates and miss the one thing to which I can look forward. Exercise is key to physical health when healing; yet, I miss yoga class due to stress and that depresses me. A funk follows, while my novel waits. The toll of healing a digit has taken up more time and psychic energy than I could have imagined. Distracted and unfocused, I open the freezer to look for fresh bread. I search for ice cream in the laundry room. Just beneath my fingernail, a gritty substance pushes the nail outward and causes pressure to the nail. It changes shape almost daily. The scab continues to reshape, shift, change colors, and hugs my finger like a suction cup. When with other people, I fold my arms to hide my hand or tuck it in a scarf I wear for this purpose. I’m surprised how few people ever notice the finger. The discomfort and awkwardness of zipping and buttoning requires that I wear pull-on pants and pullover tops. Tying shoes and wringing out a washcloth are tricky. I must close the car door, pull on and secure my seatbelt now with my right hand, so my arm and shoulder ache from overuse. I had not known how much to appreciate the powerhouse middle digit. Then hurricane Harvey hits Texas. Displaced coastal families move inland to San Antonio and surrounding areas. I visit seven gas stations without finding fuel as panic leads to lines at the pumps. Stress builds from daily driving again and now having to look for gas. So I decide to stay in San Antonio and park my car for weeks seven and eight. This helps, but I’m still looking at a rogue finger that does not function. After those two weeks in the city, Lynn and I toast the completion of two months of HBOT and hope for the best. Four days later the infection flares up in the finger again, and I’m back to treatment for another month with the good graces of Blue Cross/Blue Shield. My friends, with whom I stayed last month, are traveling and turn their house over to me. I leave on Monday mornings with our dog Murphy to drop him off at their house in San Antonio and head to treatment. Murphy and I stay each week, Monday through Friday during my third month of treatments. Lynn comes to visit every Wednesday afternoon. I simply miss writing. I miss my characters. I read books and articles about the writing process while I am not writing, but it’s not the same as interacting with plot, structure, and my beloved characters. My novel waits for me in Microsoft Word. One noteworthy day, the lower edge of the scar lifts slightly away from the flesh, fades, and begins to thin. When the doctor spoke about it sloughing off in a recent visit, I imagined layers of skin leaving one after the other. Instead, the entire thickness loosens and lifts. I am scared I will accidentally rip it, so I now cradle the hand in the other, like carrying a baby bird. When the doctor spoke about it sloughing off in a recent visit, I imagined layers of skin leaving one after the other. Instead, the entire thickness loosens and lifts. I start forcing myself to use the numb finger, retraining the muscles in my hand to hit the letters C, D, and E on the keyboard with the middle finger again. The clamoring novel is no longer mute. The rogue finger is useful again. My last day of HBOT is the first time I have trouble equalizing my ears due to sinus pressure. The HBOT technician slows the process, but my ears still pop. I use a nasal spray, hoping it will open my ears. They try again slowly, but not slowly enough. I have to abort, and so decide on that Friday I will not return Monday for my sixtieth and last visit. I graduate a day early from HBOT with a master’s degree in patience. I’m typing with all ten fingers again, which means writing, but not yet at my previous speed. News comes that a story I had submitted about my rogue finger will be published in a membership newsletter, and my personal story in a letter-to-the-editor about the need for health insurance is published in my local newspaper. Writing lessons: There is a story in most anything. Keep writing and submitting for publication. Read about the writing process while waiting. Patience pays off. Writing lessons: There is a story in most anything. Keep writing and submitting for publication. 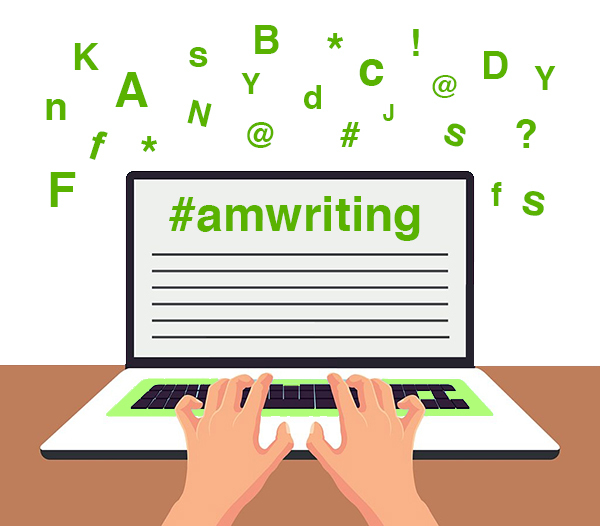 Read about the writing process while waiting. Patience pays off. Sunday morning, November 5, I accidentally snag on my sweater the remaining necrotic tissue from the top end of my finger. The tiny fragment of black tissue lands right in front of me. I laugh out loud at the misshapen but pretty pink finger and take a photo. At Quaker Meeting, I’m eager to show off my unblemished flesh-colored finger with the help of their prayers and the plastic surgeon’s advice of hyperbaric treatment. I graduate to physical therapy; and after a month, I can curl the middle regenerating finger like all the others. My commitment has paid off by holiday season. On Thanksgiving, I am grateful for an intact useful writing finger. This year the numb, but functional finger, is the best Christmas present ever. And no one is surprised by my New Year’s resolution to finish the novel in 2018. 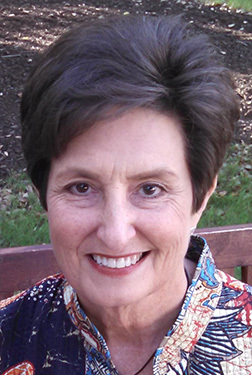 Rhonda Wiley-Jones, author of her coming-of-age travel memoir, At Home in the World: Travel Stories of Growing Up and Growing Away, is a professional speaker and workshop facilitator, and currently writing historical fiction. Short stories, essays, and travel memoirs are published on WritingItReal website and in five anthologies, Saturday Writers’ Cuivre River Anthology; God Still Meets Needs; Love Is in the Air; True Words from Real Women, Inside Out: Women’s Stories, Women’s Truths. 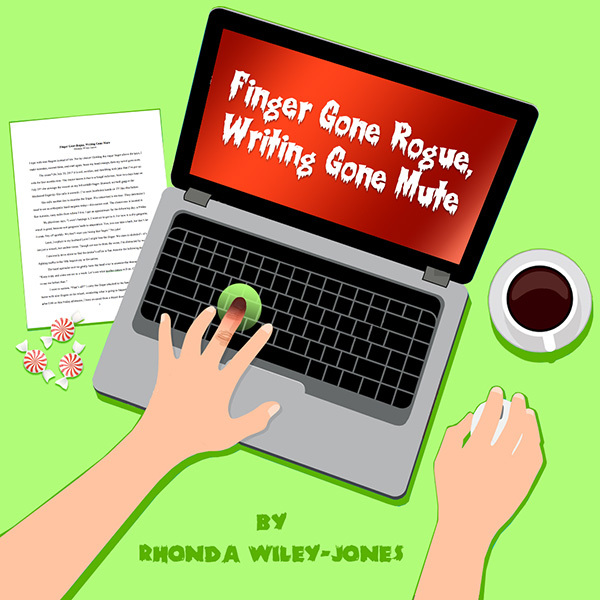 Visit Rhonda’s website and blog, www.RhondaWiley-Jones.com about travel, travel writing, and writing. Copyright © 2018 wow-womenonwriting.com All rights reserved. Graphic Design/Illustration by Mackintosh Multimedia. Web Design/Programming by Glenn Robnett.